While Lincoln hasn’t offered anything of interest to driving enthusiasts since the late and dearly missed Lincoln LS (whose advanced chassis was originally slated to be used for a truly world-class Mustang as early as 2001), the design process will always be of interest to car enthusiasts. Two press releases from Lincoln highlight the creation of a dedicated design studio, and the design process itself. Dedicated so that Lincoln designers can create a design language specific to and appropriate for Lincoln, rather than the past practice of simply rebadging a Ford and loading it with options. That practice clearly didn’t work for buyers. The company also wasn’t ready to shoulder the costs associated with it, and the existing Lincoln sales people didn’t know how to sell anything that wasn’t a “fancy Ford”. The Lincoln LS was indeed the first attempt at creating a unique Lincoln, not shared with Ford, and failed because of both the financials and the failure of the sales organization. Both are being addressed now, and the new Lincoln Design Center is an important step in the process. The press photo below shows clay and fiberglass buck of the new MKZ, along a pre-production prototype. Look closely and you’ll see an unannounced SUV under wrap (Escape-sized? ), along with what appears to be a small C-sized fiberglass buck. Interesting! DEARBORN, Mich., Oct. 18, 2012 – Lincoln celebrates another element of its reinvention journey today with the formal opening of the new Lincoln Design Studio in Dearborn, Mich., the brand’s first new fully dedicated design center in four decades. This major facility, located on the campus of Ford Motor Company’s Product Development Center, is home to a skilled, co-located global team of designers, sculptors, math sculptors and modelers representing a dozen nationalities – and with experience in just as many design centers around the world. This team is part of a dedicated Lincoln Product Development organization, creating four all-new Lincoln vehicles by 2015 to ensure the reinvented brand has a presence in the highest growth segments of the premium market. Nair pointed out two significant examples of this approach, highlighting the all-new Lincoln MKZ’s push-button shift and panoramic glass roof. 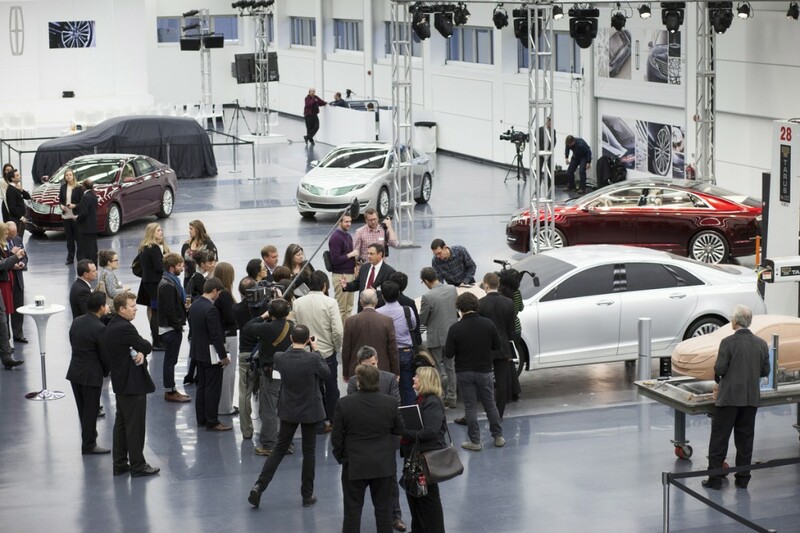 Creating a facility dedicated to Lincoln is an essential step in the reinvention of the brand. The new design studio is located in the nerve center of Lincoln vehicle development, allowing engineers and designers to be co-located. Approximately 150 design team members who work exclusively for Lincoln are also in the center. Max Wolff, Lincoln’s Director of Design, is responsible not only for the design of all Lincoln vehicles but also the environment in which they will be created. The new home is an environment where designers and engineers truly collaborate. The loft-like studio replaces walls with glass. Cubicles are banished in favor of open workspaces where designers sit across from one another. The entire space is configured to allow Product Development team members to drop in, have ad-hoc discussions and make impromptu innovative brainstorm sessions the order of the day and not the exception. The first vehicle to emerge from the new studio, the 2013 MKZ, goes on sale late this year. Lincoln has torn down its physical and creative walls with its new design studio. The studio is an incubator for design where ideas, inspiration, ability and a wide range of automotive disciplines come together to create the new Lincoln experience — luxury vehicles that combine consumers’ emotional wants with their rational needs. The creation of this type of experience begins with the brand communicating with its targeted young, dynamic and open-minded consumer. This serves as the catalyst for the design team’s vision. A vision, unlike some art, that is both creative and technical. Collectively, all 150 team members of the Lincoln design team bring vehicles to life through a design language that fosters a creative approach to premium automotive design between the pillars of regulatory standards and competitive benchmarks. The loft-like environment banishes cubicles in favor of open workspaces. Interior and exterior designers, for example, work across from one another and can share ideas. Lincoln will introduce four new or significantly refreshed vehicles in the next four years. Collaborative spaces in the studio invite the design team to come together, peruse magazines for inspiration, share ideas, get feedback and create a design vision. Once a vision has been established for a vehicle, designers began the process of sketching and bringing their ideas to life. The interior and exterior designers begin working to execute a common, complementary vision. Working closely together in an open environment helps remove any creative roadblocks that may arise from two different design perspectives. Throughout the process, designers make thousands of sketches. Once a harmonious design is developed, the team produces up to 15 polished drawings or renderings and about 20 virtual images that will be used to create clay models of the vehicle. The clay model or prototype allows all workstreams to begin editing the design. During the design process for the all-new 2013 MKZ, for example, exterior and interior designers were able to make revisions to the prototype as needed and dependent upon feedback from engineers for features like the retractable panoramic glass roof. The Colors and Materials team worked with interior and exterior designers to ensure colors, wood and chrome appliques and leather choices accentuated the features of the vehicle to create a warm, inviting environment. Clay modelers make the edits to the prototype and sculpt the design with keen attention to detail before the car begins production. Milling machines use computer-aided design to create precise clay models for aerodynamic wind tunnel testing. Often up to 20 versions are made on the large clay model. Engineers collaborate with designers to create features like the retractable roof and to make sure the design comes to life as a producible vehicle. Interior designers who envisioned a spacious interior with an open console worked with engineers to execute the push-button shift that replaces the traditional lever. Designers and engineers work as a team on exterior features as well like the standard LED lights on the new MKZ to make sure the head and tail lamps meet regulations. Before a customer ever knows about a new Lincoln, a passionate team of engineers ensures that a new model meets the design intent and stacks up favorably against benchmarked competitors. To deliver the optimum blend of sporty performance and refined ride – an attribute the new Lincoln customer demands – the new MKZ uses Continuously Controlled Damping (CCD) suspension. There are more than 1,200 individual settings that go into tuning the Lincoln CCD system. More than 4,000 man hours went into perfecting CCD to deliver the Lincoln ride DNA. Lincoln design makes a promise. The validation process ensures that the end product overdelivers on that pledge before it goes into production.